If you close your eyes and think of the ideal village inn, you may well envisage something very much like the Assheton Arms. 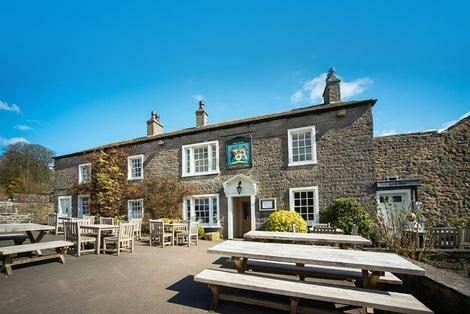 Located in the picture-perfect Lancashire conservation village of Downham, this historic village gastropub enjoys stunning views across the Ribble Valley. The welcome here is warm, the atmosphere friendly and convivial, the fires cosy, and the food excellent. A recent renovation has brought some stylish touches to the 18th century building, while retaining all the historic charm and a strong identity as the heart of the village community - no wonder the Good Pub Guide chose the Assheton Arms as County Dining Pub of the Year. The twelve spacious 5-star bedrooms are spread across Ash Tree cottage and the former Post Office building. Décor is traditional yet modern, with super-comfy beds and deep bathtubs. Families are also catered for with three family rooms sleeping up to six people. The owners are seafood experts, and this expertise shows in the AA Rosette-winning restaurant. The finest ingredients are locally sourced, including fresh fish caught by trawler Chris Neve on the Fleetwood coast, meat from Roaming Roosters and vegetables from Lady Clitheroe’s garden. A Robata grill is on hand for perfectly cooked seafood skewers, as well as succulent aged Lancashire grass fed beef, plus a varied menu including cod tagine, Goan prawn curry, fish pie, Lancashire cheese souflée and much more. Downham is one of the most gorgeous spots in Lancashire, with perfectly preserved ivy clad stone cottages and nary a modern building in sight – even TV aerials and overhead wires are forbidden. No wonder the village has proven popular as a TV and film location, including “Whistle Down the Wind,” “The Secret of Crickley Hall” and “Born and Bred.” The gloriously moody Pendle Hill, infamous for the tales of its witches, serves as a dramatic backdrop. The location lends itself to country starting from the front door, including an eight mile circular walk to the summit of Pendle Hill. Also nearby are Clitheroe Castle, the Tolkien Trail, Bowland Wild Boar Park and The Ribble Valley Sculpture Trail.